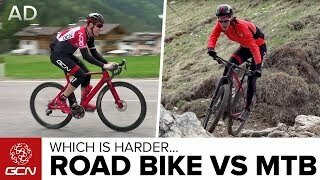 It’s time to set the record straight, which is harder, MTB or Road Cycling? Matt and Si are determined to find out, so have challenged one another. Si and Matt challenge one another to see which is fastest, a road bike or a mountain bike in a route from A-B. The rides were taken part in the beautiful Alta Badia region of Italy. Simon took to the dirt on his mountain bike whereas, thankfully, Matt stayed on the asphalt on his road bike. The question is, who will be fastest, Road Or MTB ?